There is an alley cat roaming the city. It is no ordinary city or cat. City Bingo is a community where townsfolk meet and greet around the UK. Play by day or night where there is always a light left on for you and the big cat welcomes you. The website paints a portrait of the city with the city bus ready to show you around and give you a tour. City the purple cat welcomes you and pops ups in various poses around the site just to let you know here is still around and hasn’t forgotten you. The homepage also features the latest promotions, winners, news and access to the other areas of the site. City Bingo is powered by Globalcom gaming and power some of the biggest brands in the online industry. Games are state of the art and have features that are optimized for ease of use and smooth gaming. All games on this site are fully audited and extensively tested to ensure fair play and honest payouts. Our main priorities are Security, Privacy and Fair Play for all of our customers. All games on this site are fully audited and extensively tested to ensure fair play and honest payouts. Our main priorities are Security, Privacy and Fair Play for all of our customers. City Bingo is owned by Cassava Enterprises and licensed and registered in the Isle of Man. The UK's 90 ball bingo offers 3 chances to win on 1 line, 2 lines or the full house. No wonder it is the UK’s favorite bingo game. There FREE games and tickets that cost 5p and 10p in selected bingo rooms. Additionally there is 75 ball bingo, America’s favorite bingo with a different pattern to bingo on every game. Progressive Jackpot is a bingo player’s biggest thrill with Progressive Jackpots that keep growing to impressive heights in both the 90 and 75 ball rooms. Scoop up a Guaranteed Jackpot where there is thousands of pounds awarded every month. Someone has to win it, so why not give it a shot because it may just be you. Super Slots offer amazing graphics with more pay lines on the reels. That means the wins are bigger and better than ever. Choose alternative Classic Slots with 3 and 4 reels. There are plenty of Fruit machines to choose from including the Multiplier on the reel to really boost your win. Give Blackjack and Roulette a whirl in between bingo and don’t forget about the nice selection of Instant Win games with big cash up for grabs. If you love freebies City Bingo will put a big thrill in your day because they have heaps of ways to win Free Cash. Besides the No Deposit offer for new players they will also be welcomed with a Free entry into the Welcome Guide Game with a Guaranteed Jackpot up for grabs every 60 minutes in the schedule. 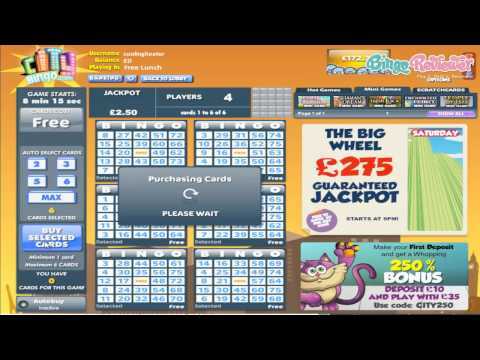 Free Bingo is available 24 hours a day where you can play absolutely free 7 days a week. The Daily Depositor Game is available to players who make a deposit with a Free Guaranteed Jackpot every hour between 11am and 11pm. Receive your Welcome Bonus and every time you re-deposit a sweet Bonus is yours. City Bingo offers lucrative ways to earn Free cash. Their generosity extends beyond many other online bingo sites. The Diamond Club offers exclusive Free Bingo, Birthday Bonus and Special Weekly Bonuses. If they keep laying on the offers i think that city bingo will be a keeper. They had me at 24 hours of free bingo! I moved right in. City the cat is adorable. The freebies at City Bingo are very good. Brilliant site! The theme at this site is really fun! The layout is sleek and well put together, setting the tone for a fantastic site! However, my biggest pet peeves with online bingo sites is when they offer very few variations for bingo. They offer only the basic varieties with 75 and 90 ball. Yes, these are typically the favorites, but it’s always nice to mix things up a bit with possibly some 30 ball and 80 ball. However, they make up for it very well with five free bingo rooms open daily. I don’t think I’ve ever really come across a free bingo deal quite like this one before. I was not too impressed with their welcome offer, I have come across much better, but it was decent nonetheless. The progressive jackpots here are really great and they have a nice selection of other games as well. Overall, I was pleased with city bingo. Although the graphics are clean, modern and good looking in high resolution, but there is just a bit too much graphics for my taste. Not a bad thing necessarily, but just a remark. As a gaming platform, they use Globalcom, one of the leading solutions. There are no downloads required, and all you need is a web browser with Flash support. No mobile site version on this site, and I hope they will make one soon. As a new player, you can start with a £5 No deposit bonus, followed with a 250% bonus for the first deposit. There are quite a few other promotions going on at the moment, so it is a good thing to keep an eye on the promotions page. Bingo is offered with 75 and 90 ball variant, which is not all that impressive. I have got used to having a bit more to choose from, although there are slots, table games and some instant variants. I am very pleased with City Bingo and I find that they really keep things unique and exciting for players. Who doesn’t want to play at a site that lets you travel to famous cities from all over the world on a regular basis? Every month, they feature a new city. I was also very happy with the welcome offer that they start out new players with. It is definitely a nice way to start out. With £30 free upon registration, you have the greatly appreciated opportunity to begin playing the games they have to offer prior to digging into your own pocket. They have a very nice gaming collection here, along with all kinds of exciting promos sure to keep you busy. Another thing I really like here is that they offer mobile gaming as well. Now, you can simply log on from your mobile device and play from anywhere at any time you prefer. City Bingo - Viva Las Vegas! If You Love Movies, You're Certain to Love City Bingo!